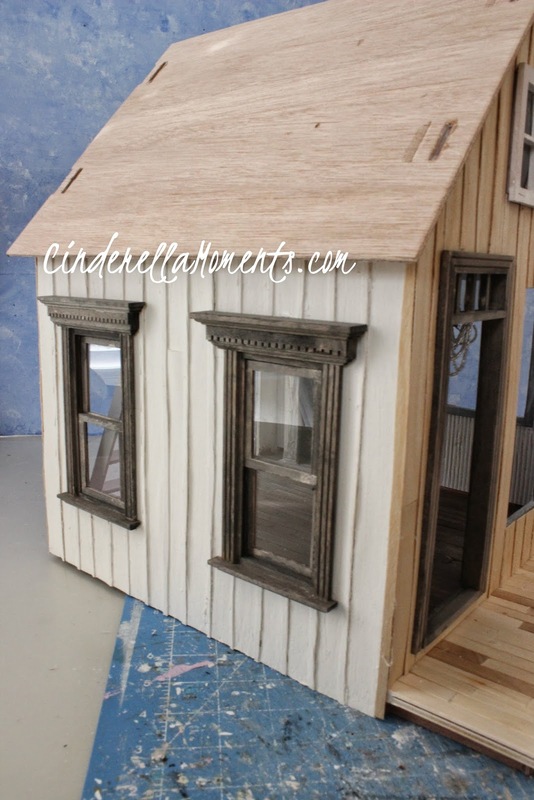 Back to the Tranquil Nordic Retreat dollhouse now! I've been working on the interior. The mantel, ceiling, ladder and chandelier. 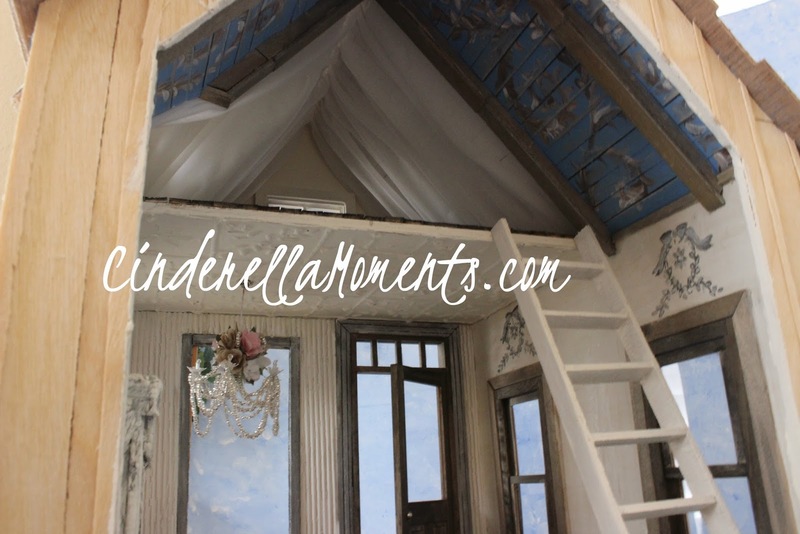 Cami, the owner if this dollhouse, showed me a photo of a house with this painted ceiling. I decided to reproduce exactly because it was so pretty. I painted the ceiling boards blue. Then I painted the scrolls. I used cream, white, light brown and dark brown paints to get the scrolls colors. The fabric is also in place in the loft section. I made the mantel. 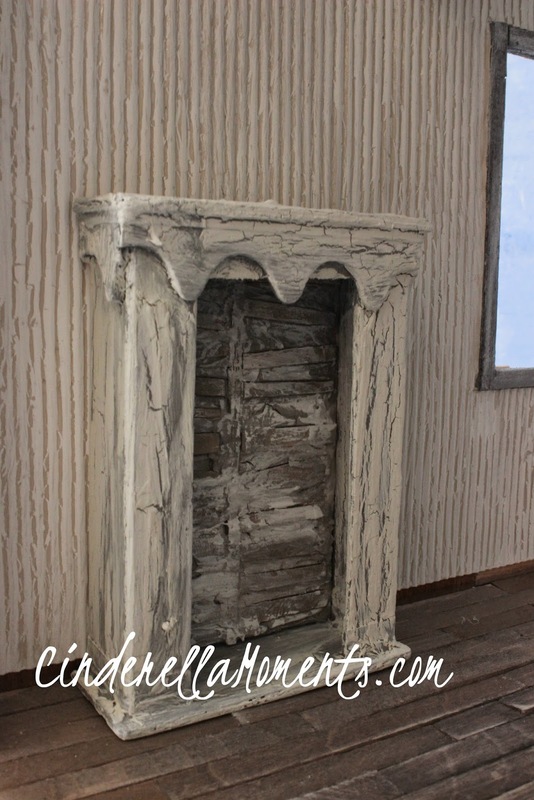 The inside is a slat and plaster finish. And I crackled the exterior. 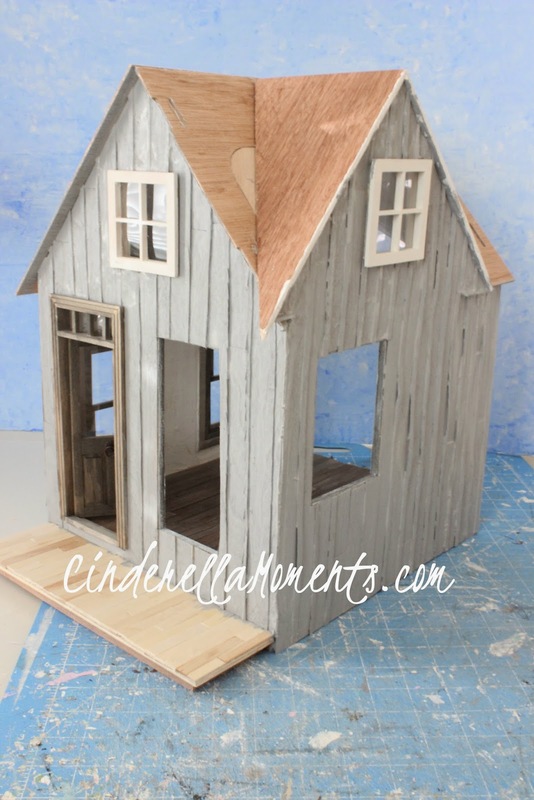 The exterior has siding. 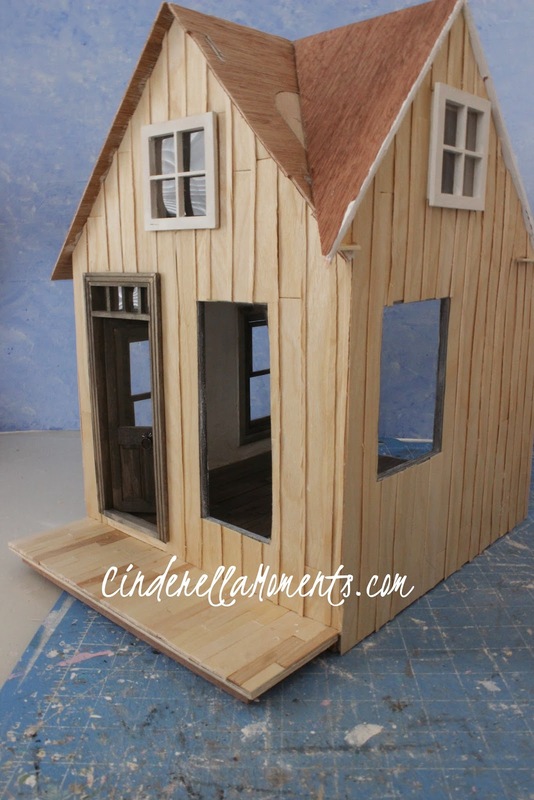 This side of the house will have a a cream or white finish. I might sand it a bit to look older. And this was the front and other side of the house before the paint. and now I wait for the paint to crack a little. Still waiting for it to dry completely. That ceiling is stunning - love it. Oh, how absolutely darling it is! 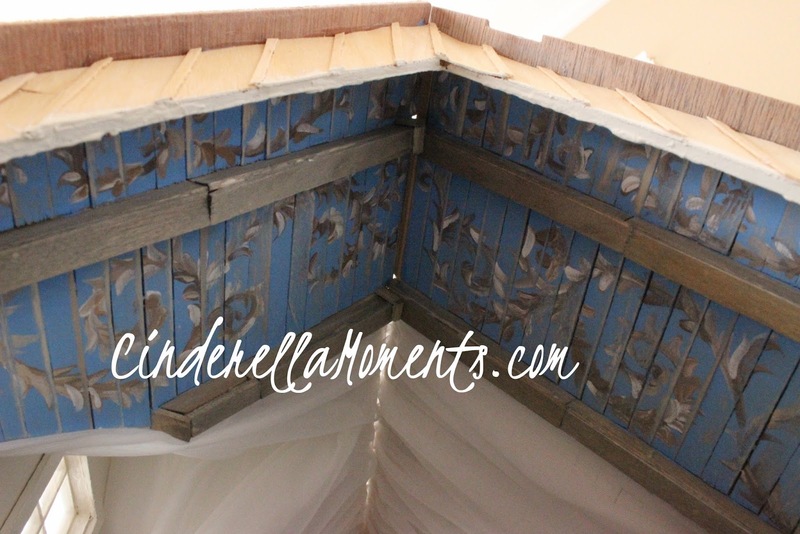 I cannot believe you were able to recreate the ceiling she wanted!!! Just wow! Love the little fireplace, it's very Nordic looking:) Can't wait to see more! Oh how beautiful a ceiling you have made. I love it. You are so full of ideas. I look forward to seeing more. What a gorgeous piece! it has all the nordic feeling around, as usual your work is a bliss to the eyesight. Angelina from "El arte de Angelina"
Absolutely stunning ceiling - I've been in a Norwegian house with one very similar to that, and you've captured it's elegant simplicity perfectly. 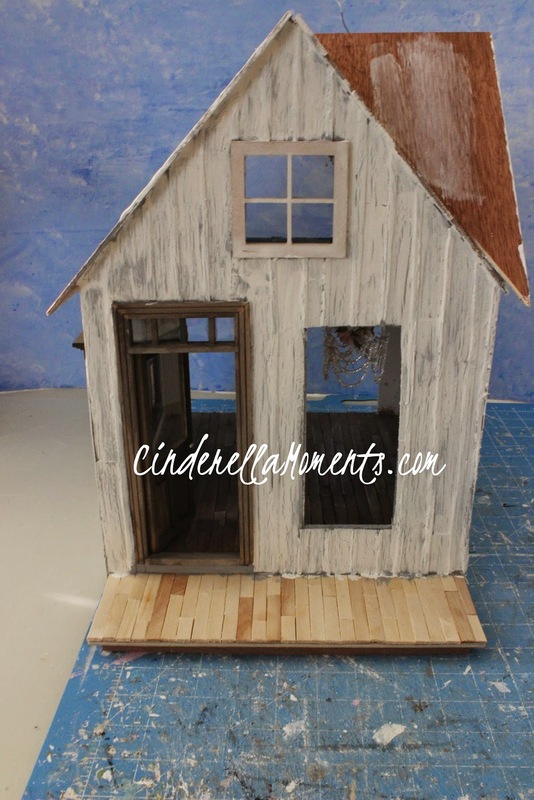 The weathered shabby look on the outside works brilliantly too... this is going to be another knockout! textures are amazing, this being lovely to look like eventually will, sure as amazing as always. a big hug! Esta quedando preciosa Caroline, me encanta ese techo pintado y el acabado exterior que le estás dando. 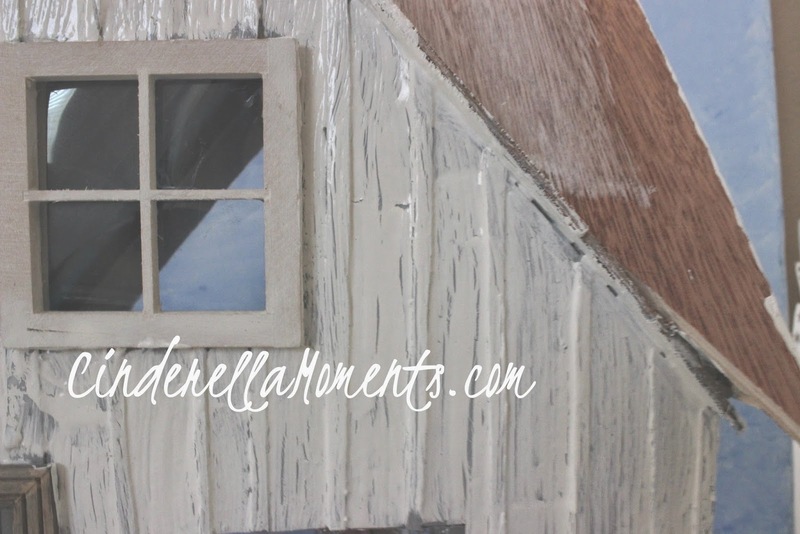 painted roof and the nifty fireplace, look forward to seeing the end result. 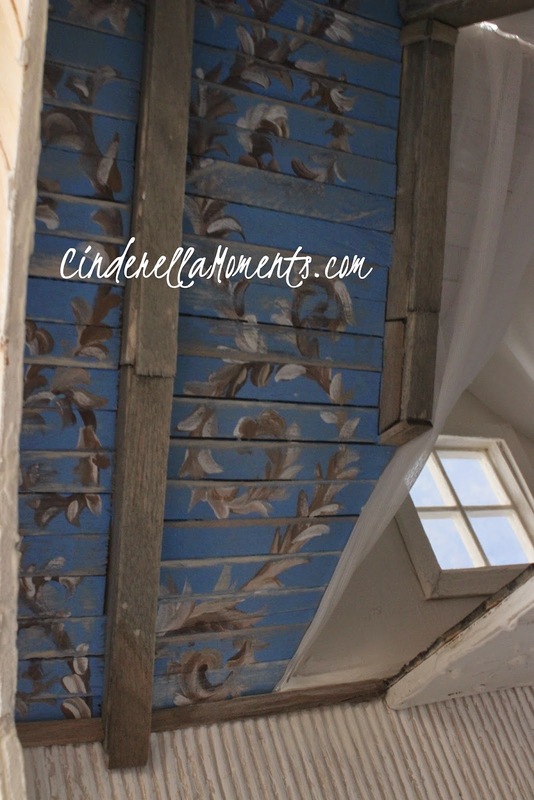 I absolutelt love the fabric in the upstairs and the paintings on the ceiling! Wow, great work, Caroline :D!! It's all adorable but that ceiling is just amazing, how clever you are! El techo pintado me parece absolutamente maravilloso,que bonito queda!!! El acabado exterior da un aspecto envejecido perfecto!!! Я с удовольствием читаю ваши сообщения! Мне нравится расписной потолок! Ваш домик будет очередным шедевром! Какая-то неполадка, пишу во второй раз! SO in love with that ceiling! The navy blue really pops against the cream. Wow Caroline - You always knock my socks off when I visit! Such an incredible eye for detail - do you also make the shells of the houses or are they from some base kit? Each one is so exquisitely different I have always wanted to ask if you are always beginning everything from scratch? I can't wait to see this lovely resort develop too! HI! 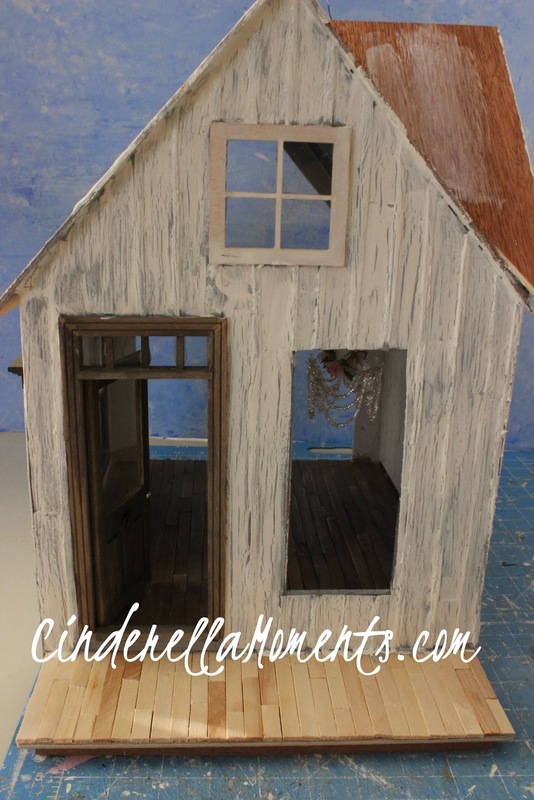 This house can either be made from a kit that you modify or from scratch. I've made it so many times now that I make it from scratch. 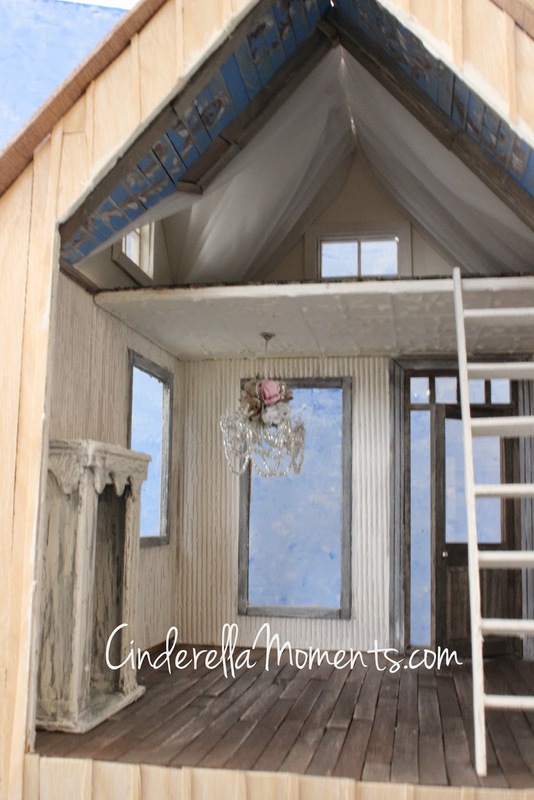 I have both ways in my book A Shabby Chic Dollhouse. If you are new to building, a kit works perfectly well. It is looking great and your painting of the ceiling is gorgeous, would have been difficult painting on boards. I have tried scrolls and they are tricky to get right, so well done! That is so beautiful! She is going to love this! The ceiling is amazing. Everything is perfect.